So states the titular character, Putney Swope (Arnold Johnson), at the beginning of the film. 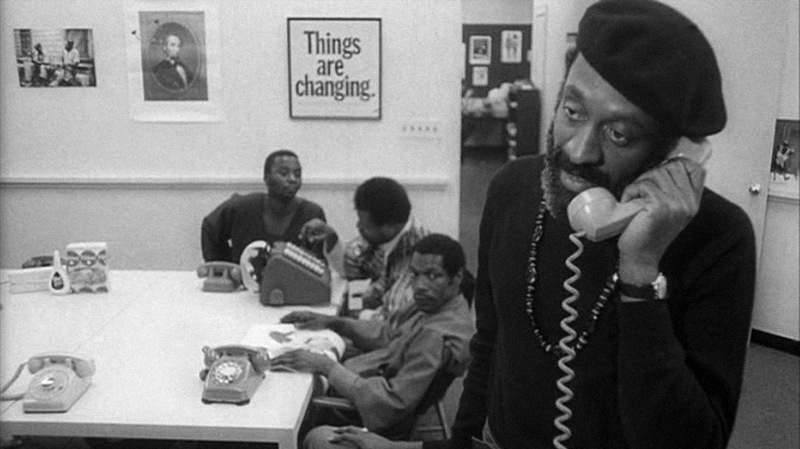 Written and directed by Robert Downey Sr., Putney Swope is an absurdist comedy that takes on race and the cutthroat world of advertising. Describing the plot of this film is kind of pointless since one of its strengths is its lack of plot and aimlessness, but I’ll give it a try. An advertising agency must elect a new chairman after the old one dies while in the middle of addressing the board. A clause states that no man can vote for himself, so each person votes for Putney Swope, the only black man on the board, assuming that no one else is voting for him. With the majority of the votes, Swope becomes the new chairman and renames the agency “Truth and Soul, Inc.” This all happens while the corpse of the old chairman still lies on the table. Swope’s one rule is that he will not advertise tobacco, cigarettes or war toys, despite pressure from the U.S. government to do so. He stands up to a government headed by a dwarf (Pepi Hermine) named President Mimeo (a physical detail perhaps made to illustrate that “the man” isn’t so powerful when you are face to face with him). Amidst all the surreal insanity in this film is Putney’s strong moral code, which functions as a kind of discernible glue that allows the film to ring emotionally true while providing laughs. Putney replaces all the crusty old white men on the board with black people who help him make wonderfully strange commercials that are apparently so successful that no one buys the products because they’re too busy staying at home watching the ads. These commercials are shot in color, unlike the main narrative of the film and they offer hilariously surreal and bizarre moments. “It started last weekend, at the Yale/Harvard game. Girl, I saw your beaver flash, and I’ll never be the same,” begins a song in one such commercial for acne cream. Oddly enough, these commercials are far from the strangest sequences in Putney Swope. The film is loaded with fantastic physical comedy and sight gags. A bodyguard attaches a string to his pistol and his pocket so he doesn’t lose his gun. A Chinese businessman throws firecrackers at the ground for no apparent reason. After losing a game show and exposing himself to the audience, a man flashes our protagonist when Putney demands an explanation from him. It’s all very strange and moves rather quickly, making it the kind of film that rewards multiple viewings. When you think counterculture film, Easy Rider usually comes to mind. Putney was released in the same year, 1969, and unlike Easy Rider, it features a predominantly black cast. Putney is highly reflective of the times. Fittingly, signs in the office read, “Things are changing.” At once, this is an intentional reference to civil rights – considering Putney’s rapid firing of anyone not able to keep up with his changing ways – and an unintentional reference to the free-spirited 1960’s era ending and giving way to the more glitzy 1970’s. And despite all this, it holds up remarkably well today. Robert Downey Sr.’s skewering of advertising agencies is just as relevant in modern times, as advertisers are just as slimy, if not more so, now as they were in 1969, what with ads shamelessly feeding off of the public’s insecurities (“So if I bring this brand of beer to the big barbecue, everyone will love me?”). As a comment on race, it also holds up, since the majority always feels uneasy when the minority starts getting some power (and sinking the boat of privilege they have been enjoying for so long). Everything about the film screams underground. The 4:3 aspect ratio, the cheaper black and white film, the seeming absence of a coherent plot; all of it can be found in this film. It feels odd because it is odd. Get on board or get out of the way.